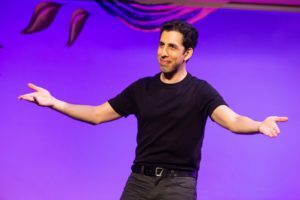 June 21, 2018: Shows featuring the work of talented magicians have become part and parcel of most recent theatre seasons, from the Las Vegas-style conjurations of multiple entertainers in The Illusionists: Live on Broadway to the more intimate trickeries of brilliant soloists like Ricky Jay or the dueling talents of Helder Guimarães and Derek DelGaudio (as in their Nothing to Hide). The newest kid on a New York stage showing off his card and other tricks is Vitaly Beckman, a born-in-the-USSR soloist whose appealing but far from extraordinary magic show, Vitaly: An Evening of Wonders, is occupying the upstairs space at the Westside Theatre. Much of his cachet comes from his having stumped Penn and Teller on TV’s “Fool Us,” where he pulled off a head-scratcher that’s also in this show. Vitaly, who says his accented English makes him sound like Borat (a.k.a. 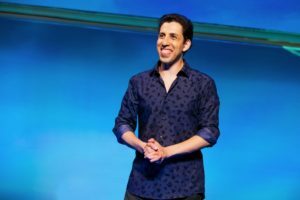 Sacha Baron Cohen) while he physically resembles Jerry Seinfeld (or, I’d say, Sacha Baron Cohen), offers an hour and ten minutes (including a brief break) of magic and conventional jokey patter (Doug Bennett is his co-writer). Working on a mostly bare stage with a few tables and chairs, backed by a projection screen, he demonstrates, with only the simplest props, a series of charmingly baffling illusions. Depending throughout on audience members coming on stage to help him, Vitaly projects close-ups of many of his bits onto the screen via a tiny, stand-mounted camera. These include not only various card tricks (no huge surprises here for the visiting wizards) but several imaginative ones that require drawing simple images in black ink on a pad, rubbing his hand slowly over what he’s drawn, revealing the now fully-colored image, and then somehow detaching the image from the page as an actual, if flat, object. 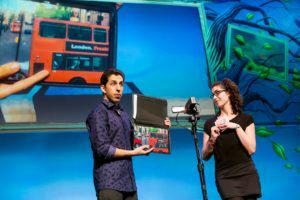 He executes a number of variations on this effect, while also applying his prestidigitation to preprinted images, including the routine he did for Penn and Teller, which employs a still photo across whose surface a London bus begins to move. One lengthy segment involves collecting a bunch of drivers’ licenses, on one or two of which Vitaly manages, by rubbing his fingers over a face, to obliterate it. Later, after he’s collected from the audience a list of famous people no longer living, he asks someone to read the first name on the list, and that person’s face not only replaces the license’s original but flutters its eyes. Vitaly makes objects, like an apple, levitate and follow a fixed aerial path; shows an artist’s paint brush doing its job without virtue of (visible, at any rate) human assistance; offers eye-opening legerdemain while having silver dollars over his eyes covered by black tape and a blindfold; transfers people pictured in one photo to another; and, among other illusions, forces a card that someone has written on to appear instantly inside a clear, plastic bottle. Vitaly’s show, which lists no director, is certainly amusing and its tricks are as likely to stump us as they did Penn and Teller. It has a low-tech, low-budget feeling that suggests the even more mindboggling street magic artistry of David Blaine. When compared to the more technically sophisticated pizazz of, for example, last season’s Derren Brown: Secret, the show’s script and ambiance, not to mention the exceptionalism of its magic, lose a few points. Vitaly offers the kind of illusions that would make someone’s bar or bat mitzvah the talk of the seventh grade. 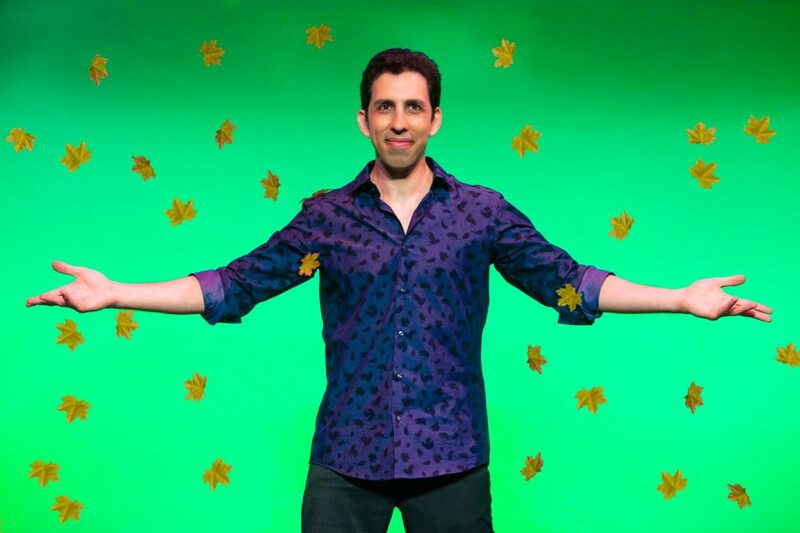 As a mainstream Off-Broadway show, however, Vitaly: An Evening of Wonders stops this side of wonderful.